Another installment in our blog series ‘Favourite Things’, where we ask lingerie industry professionals to pick a favourite object from our collection. Today’s selection comes from Stephanie Bodnar of Evgenia. Evgenia specialises in luxury lingerie inspired by 1930s lingerie silhouettes and the 1920s embellishment technique of lace insertion. The brand’s ‘Night Garden’ set is part of the museum’s collection. Stephanie’s pick is the Overlocked Floral Jacquard Weave Ribbon Corset. I had such a difficult time picking my favorite piece from The Underpinnings Museum’s catalogue. There are so many wonderful examples of vintage and antique lingerie, and all of them spoke to me in some way. 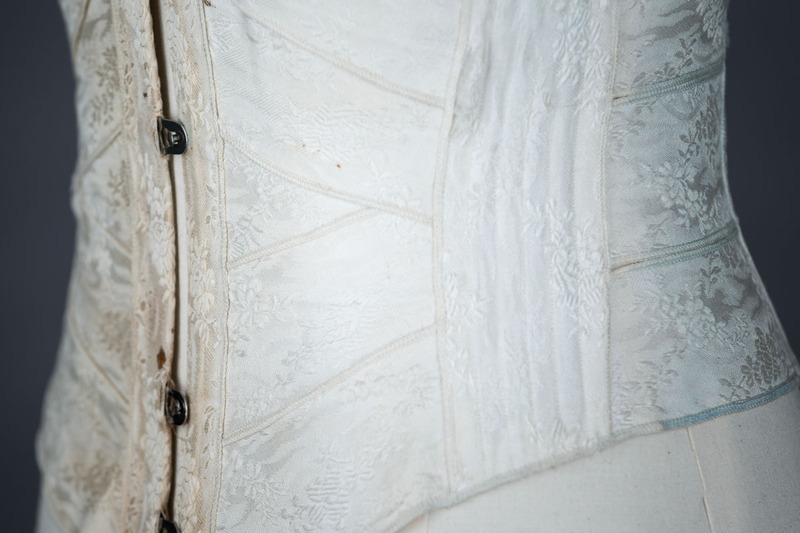 From insertion lace bows to meticulously corded corsets, I am in love with everything! Overlocked Floral Jacquard Weave Ribbon Corset, c. 1900, Great Britain. 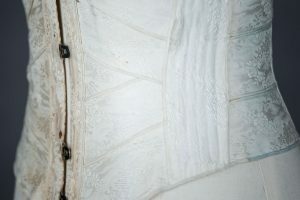 That said, the piece that has probably the most special place in my heart is the Overlocked Jacquard Ribbon Corset. The finishing is so unlike any other ribbon corset I’ve seen (I didn’t even know overlock machines existed in the teens). I have a similar antique ribbon corset that is in terrible shape, which was the foundation for my own Evgenia Ribbon Corset. The version I make was redrafted for a modern silhouette, offering a gentle cinch (something I call “corsetry lite”), perfect for first-time and casual corset wearers. I have always loved the ribbon corset style because it is so resourceful – whoever came up with the idea was an absolute genius. The idea of using separate ribbons for shaping is just so interesting. 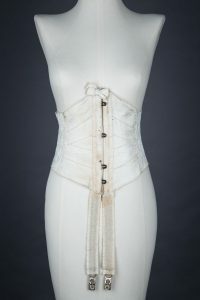 Usually the panels that make up a normal corset are vertically oriented – and I think it’s pretty amazing that the traditional S-curve was able to be achieved with this unique approach. And it’s a beautiful, feminine style to boot! You can see Evgenia’s lingerie designs here. If you had to choose a favourite piece from our online collection, what would it be?